Fiio has been killing it lately when it comes to performance for the price. 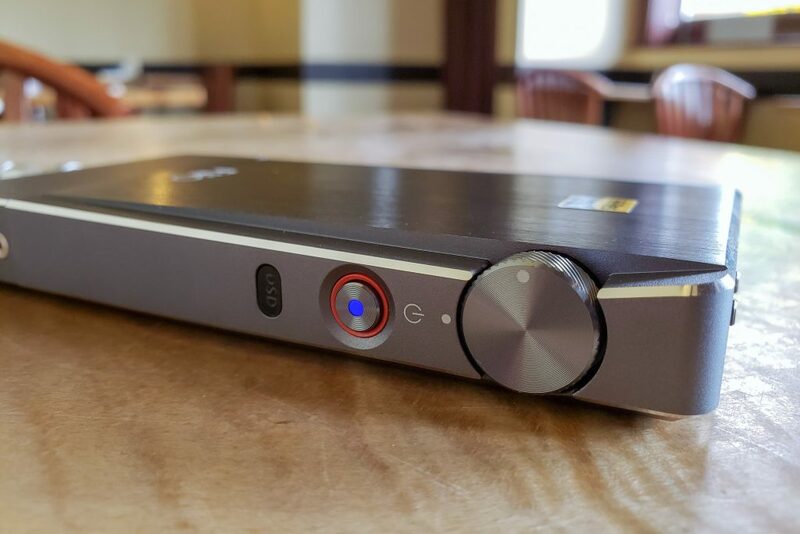 Earlier in the year, the company gave us the chance to test drive two ends of their audio player spectrum, from the tiny $50 Bluetooth BTR1 DAC to the top-end $650 X7 Mark II Android-powered HiFi player. We were left impressed either way. 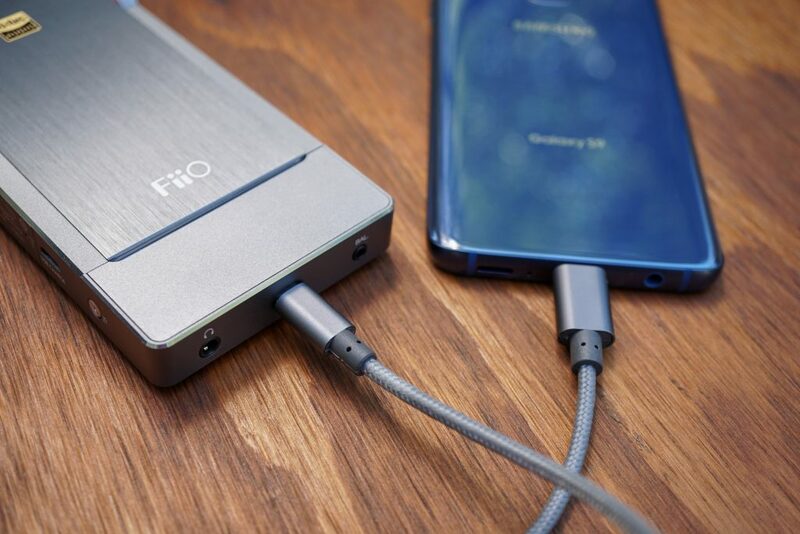 But being that Fiio’s has beginnings in the mobile DAC market, the most promise is held in its latest flagship DAC, dubbed the Q5. Right from a glance, it’s apparent that Fiio is carrying over design cues from its metal-clad DAP (digital audio player) series. This is fine with us; we loved the brushed metal and chiseled aesthetics of the X7 II. We’ll examine what you get with the $350 Q5 DAC, and if it’s the right Fiio player for you. We’re tempted to sum up the Q5 DAC as a X7 II without a screen (especially with a brushed-metal panel on the front that looks like where a display should be). The two devices look very related, from their block-of-Aluminum form to that slit that glows an adjustable light. We loved the X7 II’s premium feel and attractive, angular aesthetics, so we’re glad to see the same build quality in a device half the cost. That said, there are plentiful differences around the Q5’s exterior that give it its own identity. For instance, turn it around and you’ll a substantial deviation – a classy-looking, black leather lining taking up most of the back. We love this contrast and break from the otherwise completely silver Aluminum look. The leather also helps the DAC stay still on a tabletop – a small contention of the smooth, relatively slippery X7 II. We also no longer have to worry about scratching the pristine metal surface. Maybe this is why Fiio did not include a case in the box, like it did with the X7 II (or maybe it’s because the Q5’s lower price). We would’ve still liked to see a case, as the rest of the chassis is vulnerable to the elements. At least there’s a quality, draw-string bag for transport. 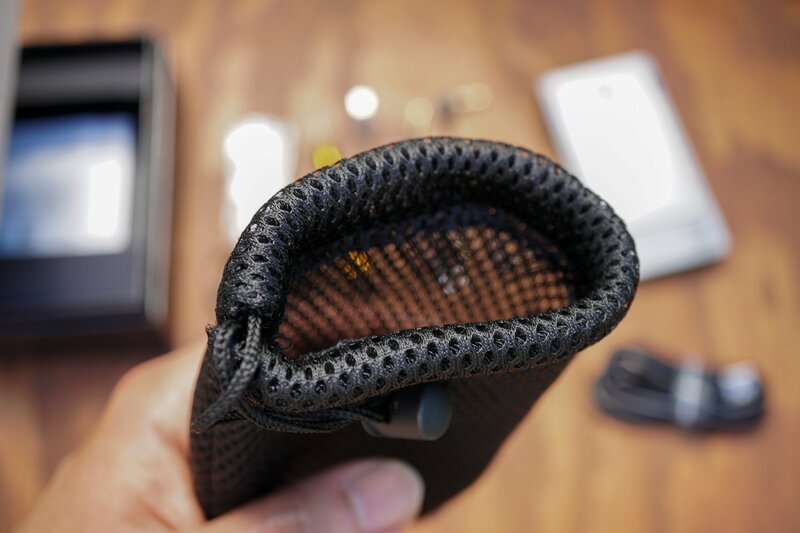 Mesh carrying sac is thick and should keep the Q5 safe. 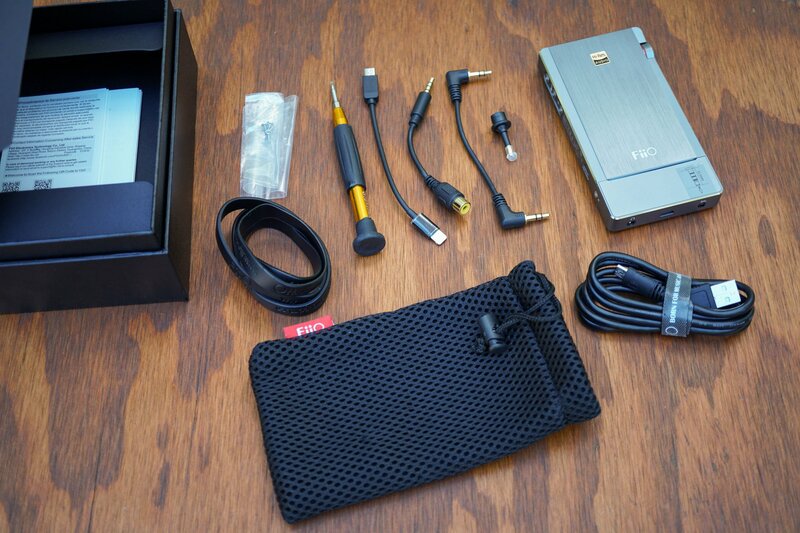 Speaking of the packaging, in typical Fiio-fashion, we get an array of accessories. Though, it’s not as extensive as we’ve seen before (like the omission of a protective case); basically what would be essentials for usability, like a charging cable and a couple I/O methods. We were disappointed to only see a Lightning-to-MicroUSB cable for passing through the digital signal. Fiio is ignoring Android users, making us get our own digital cable before being able to use the DAC with our phones. It’s not a big deal, as these cables are cheap. But for a device that’s mobile and depends on that cable, it should’ve been included. Back to the unit itself, we catch a lot of the same ports and controls around the perimeter as seen in its X7 II brother. The 3-button playback controls are on the left side, primarily consisting of back/forward track and play/pause in the middle button. This is also how you turn Bluetooth on and pair, by holding down the middle button. 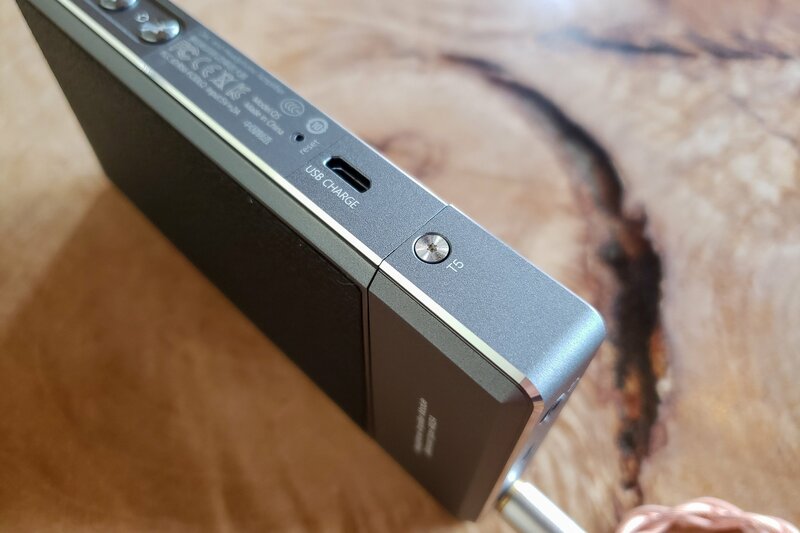 The Q5 has separate microUSB ports for charging and digital audio pass-through (Boo for no USB-C). You’ll see the charging port under the playback controls on the left side, and the digital out is on the bottom of the device, in between the two headphone output options, 3.5mm standard or 2.5mm Balanced. 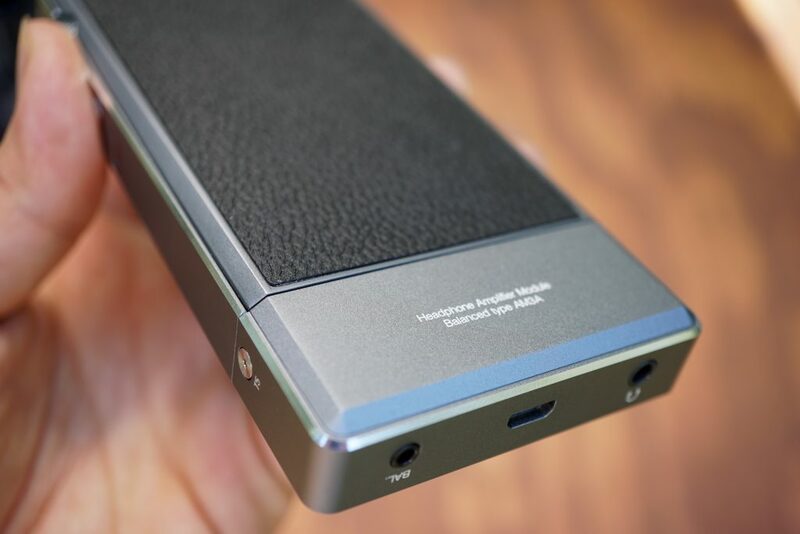 Yes, Fiio carries over the capability of Balanced audio as seen in the X7 II. On the right side, we see a rotary volume dial significantly larger than the one on the X7 II. There’s a dot indicator so you can see where the volume level is set. Right under that is the power button, with an LED at the center to indicate if the device is on or not. Volume dial firmly and smoothly rolls. Of course, the DAC can be used for better audio out of a computer (you can use the supplied USB-to-microUSB cable for this purpose, as well as charging the device). 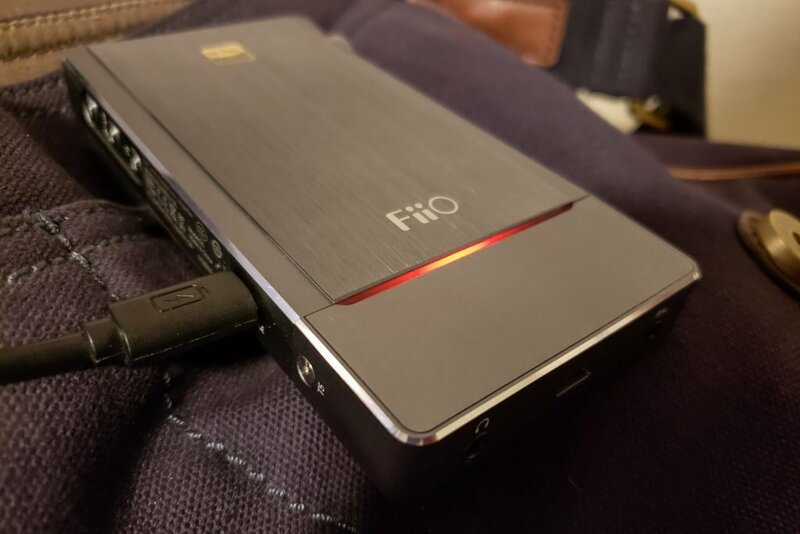 Fiio takes flexibility a step further by making the Q5 Bluetooth-capable, and it remembered about the aptX codec for transmitting a higher-fidelity signal. However, it’s our opinion that any “HiFi” player today shouldn’t be incorporating any less than aptX HD bandwidth (352 vs 576 kbps). Both standards are a far cry from “high res” but if you’re going to do Bluetooth in this kind of device, you should be using the best standard available. There’s plenty of affordable USB-C to microUSB OTG cable options on Amazon. However, first and foremost, the Q5 is meant for wired pairing with a mobile device. Once we got a USB-C to microUSB cable, getting the digital audio signal passed through from our Galaxy S9 worked like a charm. At the top of the unit, you’ll see a couple other I/O options. One port handles all of the other input support: optical (using the supplied adapter), coaxial, and aux line in. The other hole is simply a line out, for sending the audio signal to another system. The top of the Q5. This is also where the basic signal tweaks live. If you have higher impedance headphones and the volume level isn’t quite cutting it, you can toggle the gain to High. Similarly, if the bass isn’t tickling your fancy, there’s a one-setting boost. Speaking of which, another feature that the Q5 borrows from the X7 line is the ability to change out the amp. It uses the same design/form as on the X7, so you have access to all the modules available for that platform. Pretty neat. The removable amp module is located along the bottom. 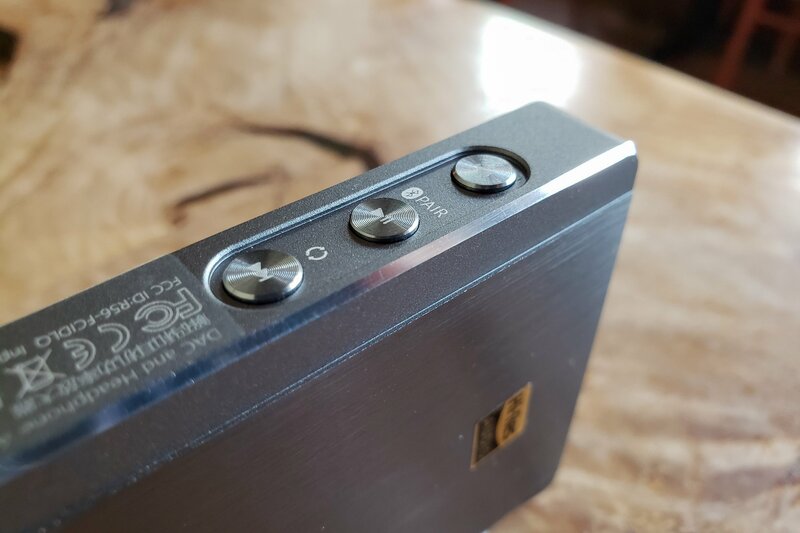 Fiio provides a screwdriver for the screws on both sides. The Q5 comes with the same AM3A module as the X7 II, which can power most headphones and has Balanced output. Via the presence of the X7 line, various different amp modules exist, providing different jack configurations and higher power output for more beastly headphones. Going back to that glowing light on the front, Fiio added some functionality this time around. It has RGB access, and uses color coding for different things. When the unit is turned on and connected (but not playing), it’ll show as White. Different signal inputs light different colors, and the color Blue is used when Bluetooth is running. Lastly, it will flash red when the battery is low or the device is charging. Though, we wish there was a way to know the battery status above that point. Speaking of battery life, the Q5 packs a 3,800mAh capacity that reaches about 10 hours of playback. This is either using the DAC in wired or wireless mode. Judging by the rest, we were expecting audio quality and a sound signature from the Q5 like that of the X7 II. This would be a fine thing. We adored the well-rounded and lively audio from the X7 II, and we’d be getting that top-notch experience at half the price with the Q5. 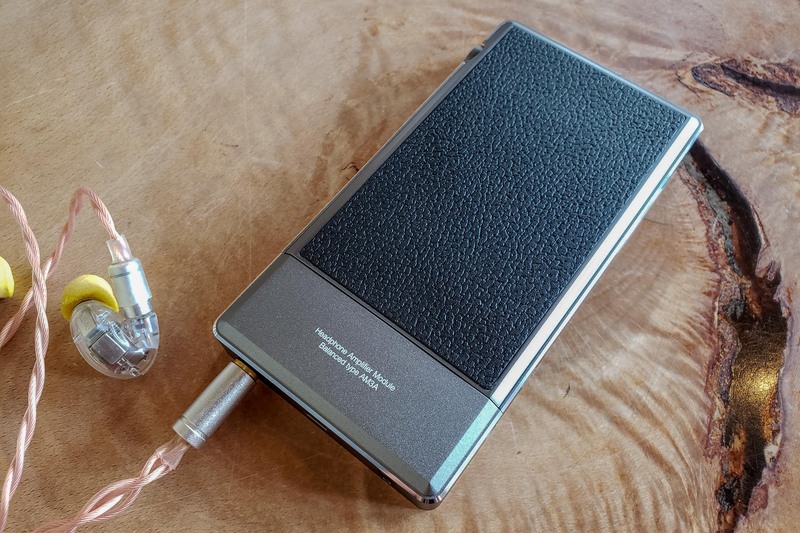 However, where the X7 II uses a SABRE ES9028Pro DAC for sound processing, Fiio opts for a solution from AKM for the Q5 – the AK4490EN, to be exact. Both mobile DACs are from trusted manufacturers (for instance, AKM is found in many of Astell & Kern’s high-end audio players). The AK4490EN is actually a dual-DAC chip, so we were really interested in how it sounded in comparison. The Shure SE846 have a gorgeous sound paired with the Fiio Q5. Despite hardware difference, Fiio’s excellent tuning can still be heard in the Q5. That is, an exceptionally balanced spectrum and authoritative mid-range. 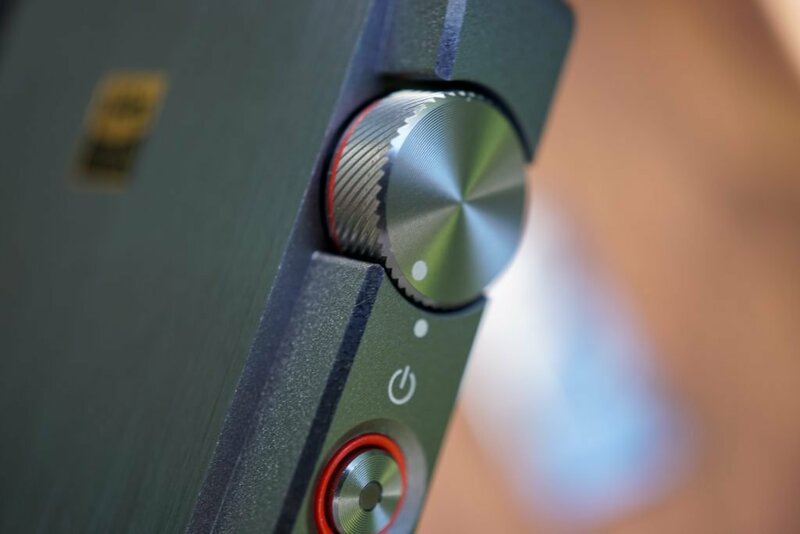 The Q5’s price isn’t “cheap” in the grand scheme of things, but when you hear the cleanness, articulation, separation, and detail that this DAC pumps out, the reality comes into focus. This is true audiophile-grade quality that usually costs closer to $1K. Like with the X7 II, we can’t say enough good things about the mid-range. Its in-your-face reproduction (in a good way) and exemplary airyness really enhances the listening experience. You get engaged with the music in a level not achieved by most. None of the ranges miss the opportunity to utilize the open soundstage. Dynamical play is free-game, and if you have a high-end headphone that can resolve depth, you’ll hear the dimensional sound it’s capable of with the Q5. Regarding specifics, the neutral sound signature may not suit bassheads. This is more true of sub-bass than mid-bass, of which there’s plentiful punch for us. The sub-bass is subtle, but you’ll hear its nicely rounded quality and rumble when the track dictates it. The mid-bass more tamed than what you may be used to, but it’s super clean in return (complimenting the mids perfectly rather than interfering with them). 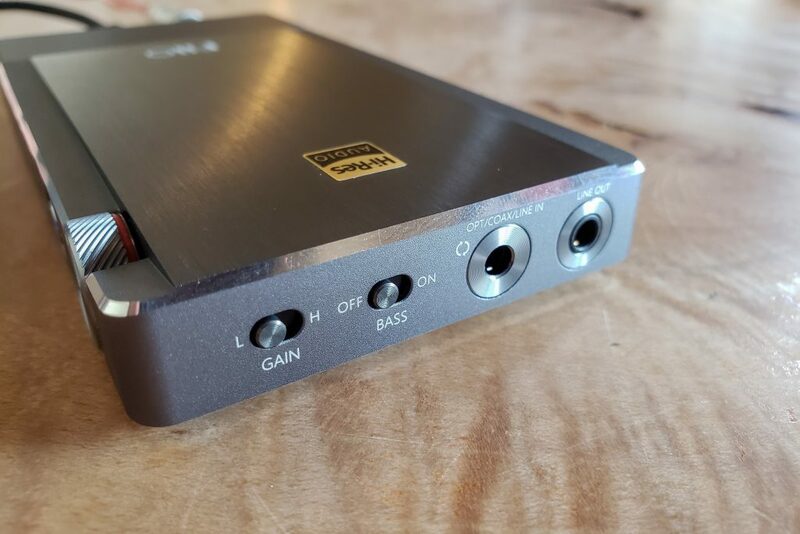 You have the bass boost option via the switch we talked about, but it bloats the low-end too much for us. The treble range shares the same cleanness and articulated kind of response that we’ve noted of the rest. With many reproductions, the treble can get pushed back when there’s a lot going on. Not so here; it’s as present as the rest. Actually, its spacious and high-reaching quality and pin-drop clarity many times captured our attention most of all. You’ll be able to pick up detail you may not have heard before in your favorite music. Ultimately, some folks may find that the Q5 is “light” in some ranges. But it’s apparent that that’s done for cleanness, detail, and balance, all of which is important for true, high-end audio. That said, the Q5’s overall sound is far from sterile. It’s very lively and pleasing. 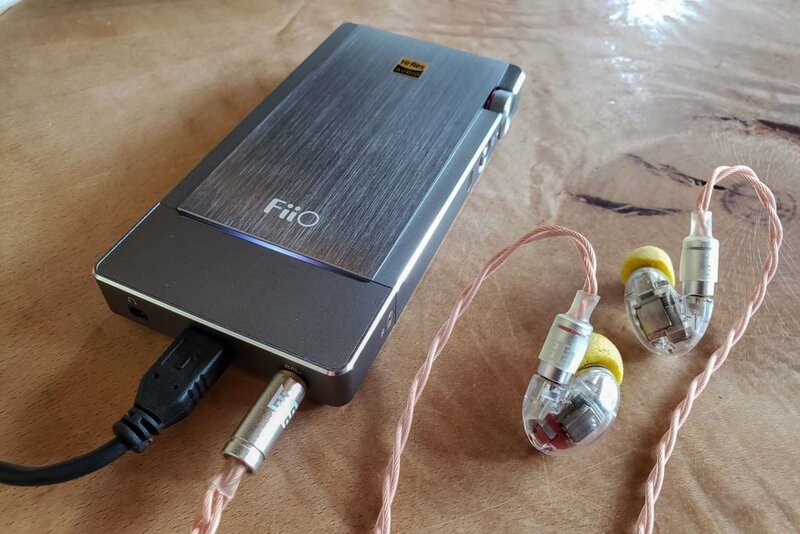 Fiio has become very skillful at this craft, and we’re glad that it is still standing by its “value” ideal, rather than continually upping its prices like its competitors do. Suffice to say, the Q5 is a winner. It’s not just that it’s solidly constructed with premium materials and is packed with features, but its biggest success is in what it’s ultimately meant for – stellar audio. 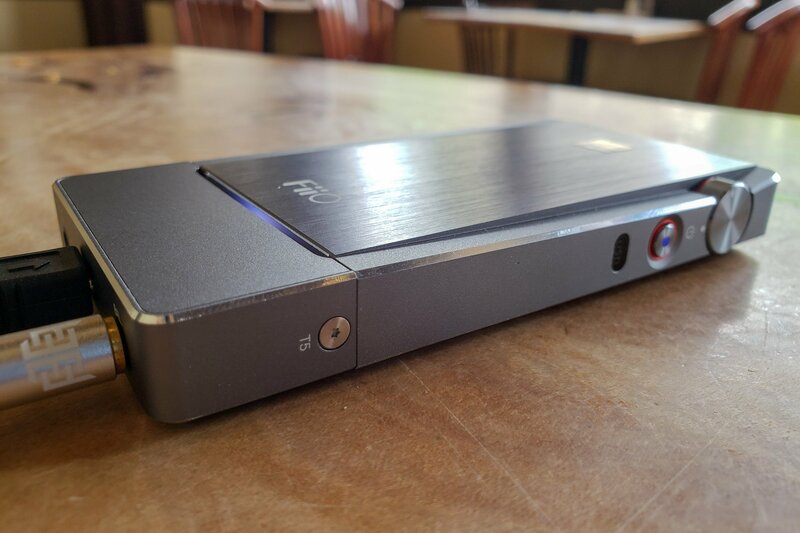 At $330, it may not seem like a great value to those new to this field, but it really is when you look at the high-end portable DAC market. The Q5 can stand toe-to-toe with them at half the cost. 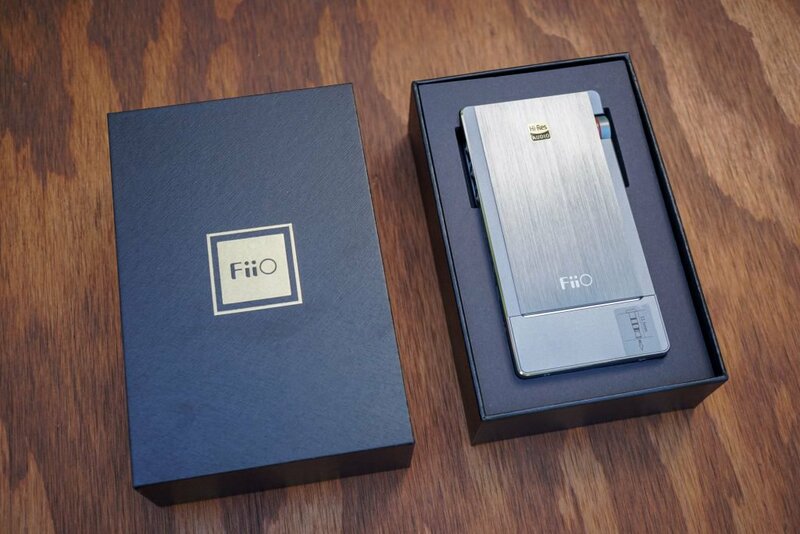 We’re really glad that Fiio is continuing to show them how it’s done.